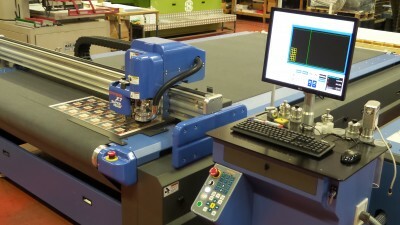 KSP further invest in a DYSS X7 state of the art digital cutting system. With demand for even larger sheet sizes, quicker turnarounds, lower prices and an ever increasing list of materials to cut, August 2015 sees KSP further invest in a DYSS X7. This state of the art digital cutting system now sits alongside our already impressive array of print and finishing equipment. We can now offer precise high speed die less cutting of virtually any material up to 3,050mm x 1,650mm x 20mm, including rolls of unlimited length. Additionally, precision cutting of jobs longer than the table can be cut with the automatic roll feed and conveyor system. Printing and media distortions, present in all jobs are dealt with using the K-Cut software which efficiently records these non-uniform distortions and calculates new optimized cut paths giving precise results time and time again. This reduces waste and enhances quality. The system also easily copes with kiss cutting of very thin self-adhesive PVC’s.